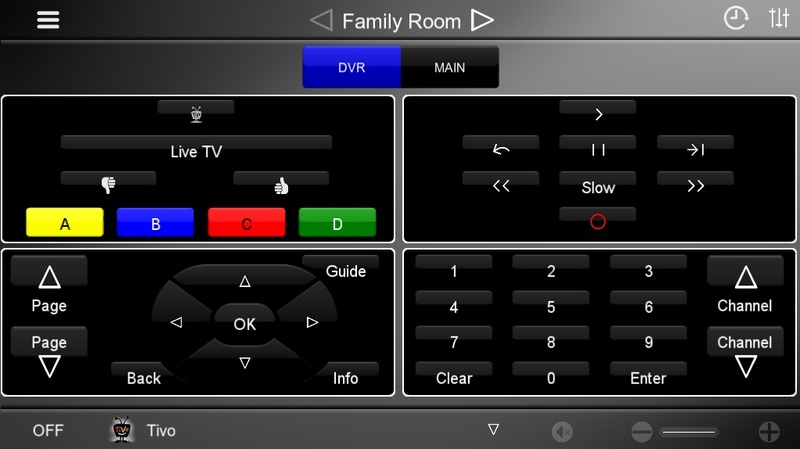 The Elan Home Systems media control interface is expansive, but we’ll try to do it some justice with a few screenshots that are fairly self explanatory. From our more general overview on using Elan Home Systems we know that from the main media screen we can select sources, control volume, and even see some basic information on what is playing through different zones. The one point I’d like to touch on is the zone grouping. On this media page there is a “group” icon on the top right. This is to help easily assign zone groups and toggle them on and off. Zone groups can be assigned so that a whole group of zones can be assigned a source (music) and the volume controlled all at once. 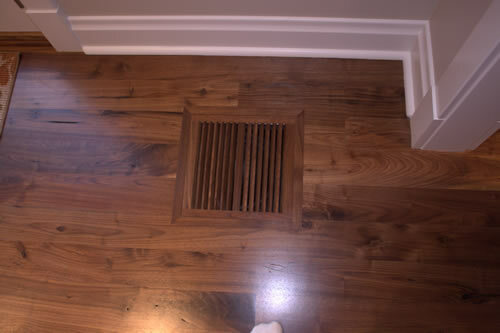 This is useful when having house parties and the ambient music is generally the same throughout the home. When zones are grouped, it’ll being the meta-data right to the front page. This is the first screen that is scene when selecting a one of the listed rooms (zone). This is just a simple selection of sources. 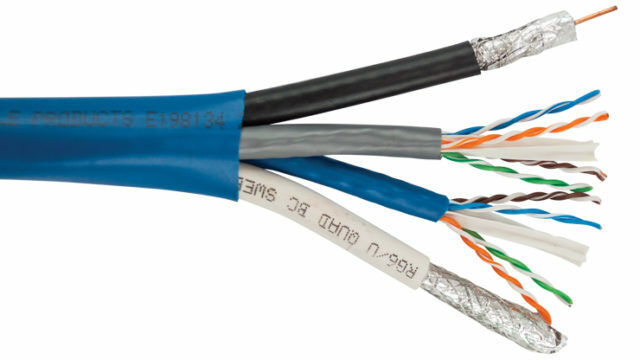 I have 4 sources hooked up for my demo. Tivo, Blu-Ray, and Apple TV are all video sources that when selected will be played on the TV. We will stick to these right now. 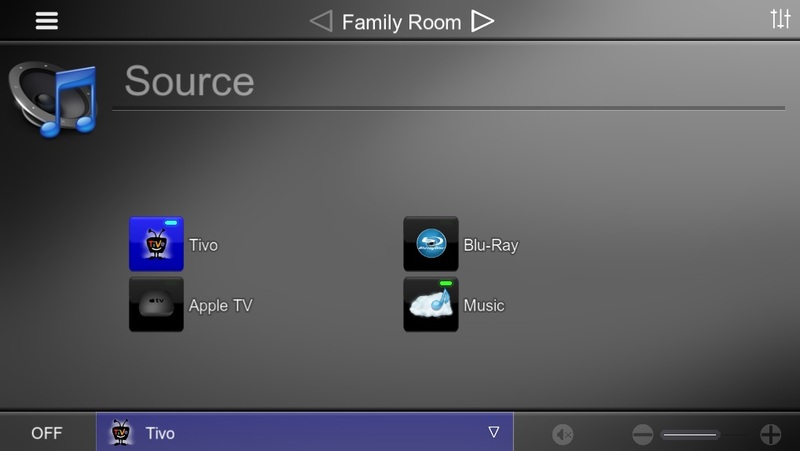 When the Tivo icon is selected, the surround sound system is turned on, switched to Tivo, and then played out to the TV which has just been turned on as well, all from the selection of the source. 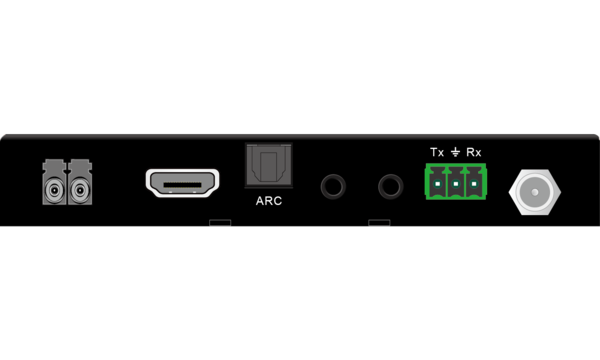 The page that you see offers control over the Tivo simply as a Tivo remote. The “Main” icon has just been selected, and this is where I’m keeping my favorite icons. 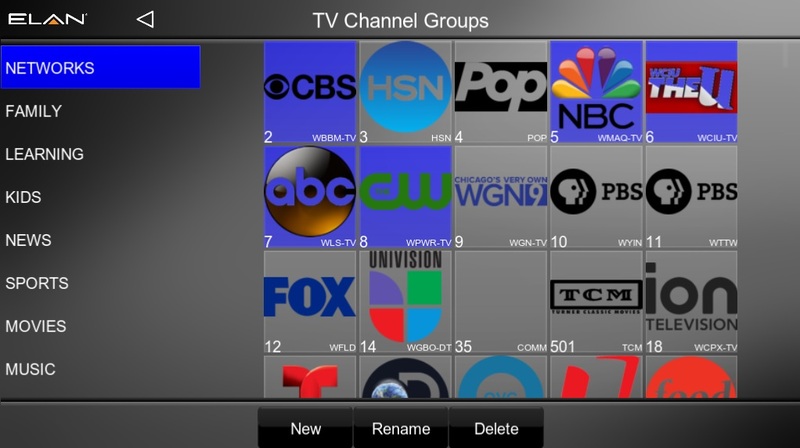 You can select a favorite icon and the Tivo will automatically switch to that channel. These favorites and favorite groups (networks, news, family, kids, movies, etc) can be user edited through the same interfaced. 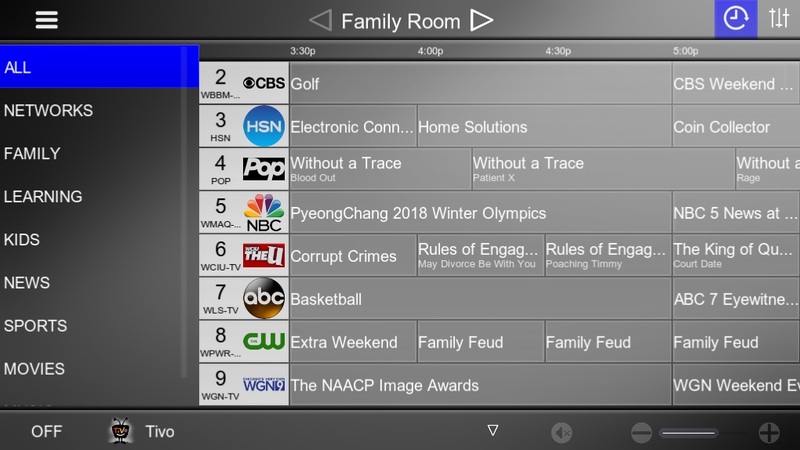 For cable, satellite, or over the air (OTA) devices in locations where there is data available, the schedule icon on the upper right of the main tivo controls can bring up a guide. 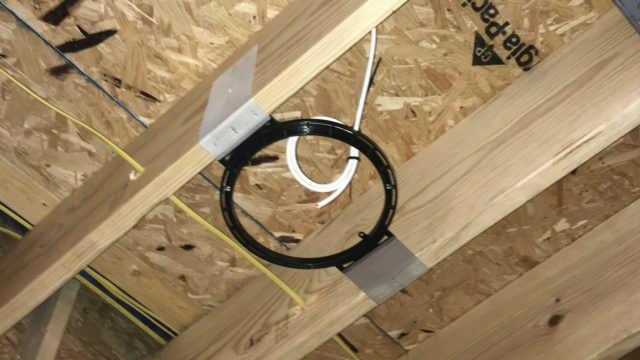 From here, you can tune directly to the channel. This makes it easy to browse a guide while simultaneously watching TV in full screen. If we were to have selected “Blu-Ray” or “Apple” TV, we would only get control over the device but there would be no favorites. When a music source is selected it brings you up two-way control with the device that is providing the music. The TV can be automatically turned off, or left on it’s last state. 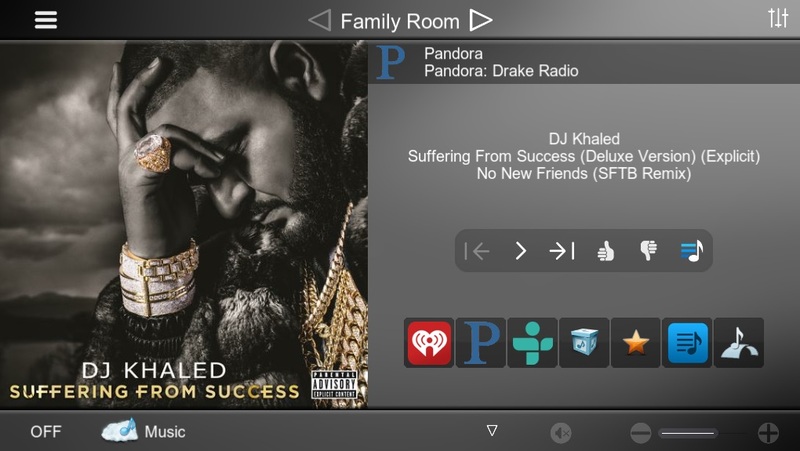 Depending on the media server, more icons can be added to this screen for sources like Pandora, iHeartRadio, TuneIn, Spotify, Deezer, Tidal, etc. By selecting the “Box” icon, you can browse your own music sorted by artist. If you go back to the main screen, you can select “music” in any of the other rooms and they too will start playing this stream. 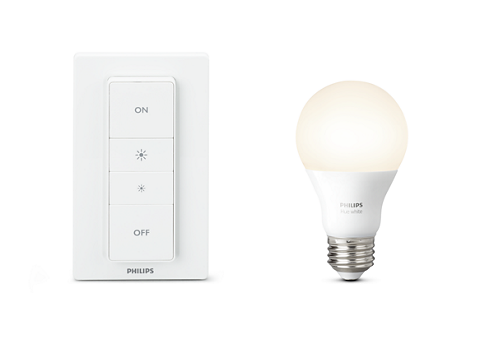 For quick selection of rooms that are usually set to play the same music, zones can be grouped so that they go on and off together, and easily ungrouped by the end user at anytime. The “star” icon indicates favorites. You can put favorites on this page across all of the different streaming sources.